I am proud to say that I received a POP Excellence Award at the 2014 symposium of the American Association of Woodturners, held in Phoenix in June. I was one of five recipients chosen for the award by the Professional Outreach Program. Especially exciting to me is that, whereas the other awards were given for single pieces, mine was awarded for the body of work I had on exhibit: six pieces, shown below. 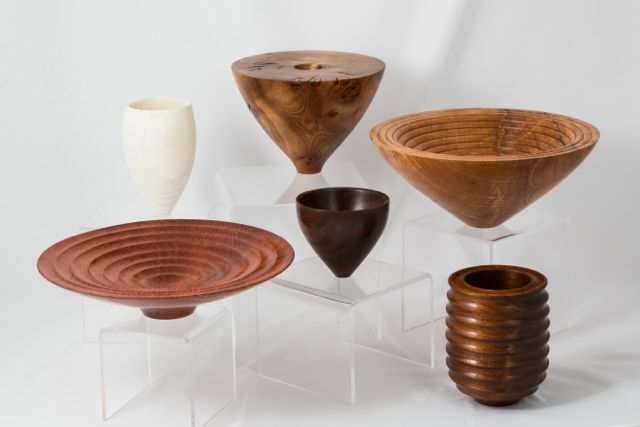 The award-winning works are highlighted in the October issue of American Woodturner, inside the front cover. At the symposium I also presented “Turn a Blind Eye,” a program about how to turn more safely, and spoke on “How to Make a Great Demonstration,” a panel with David Ellsworth and Andi Wolfe. Back row, from left: “Ashes to Ashes,” bleached and sandblasted ash; “Crackalicious,” eucalyptus; “Filled to the Brim,” spalted curly maple. Front row, from left: “It Comes in Waves,” bubinga; walnut bowl; “His,” walnut. Photo by Andi Wolfe, copyright 2014.